While romance is all good and fun, it’s still so important to have a best friend who will always be by your side. I have always cherished my friendships, and made them a big priority in my life. No matter what ups and downs our romantic relationships might take, my best friends and I are always there for each other to fall back on. To show one another how important our friendship is, my besties and I like to take each other out on “best friend dates.” It’s pretty much just an excuse to go on a fun adventure with a friend. And I highly recommend it. Getting my nails done is one of my favorite little luxuries. And it’s even better when I invite a friend to come along with me to catch up on each other’s lives and read magazines together. It’s also a great way to treat a friend if you missed her birthday or if you have an outstanding “IOU” (say…from those drinks she bought you last Friday). If you follow me on Instagram, you probably know that frequenting my local farmer’s markets is one of my favorite ways to spend a weekend morning. The next time you go to an open-air market, invite your bestie with you to sample all the treats. Maybe even buy the tastiest thing you sample and take it to a nearby park for a mini picnic. Aside from going to the farmer’s market, going on long hikes is another one of my staple weekend activities. I love inviting a bestie to come along with me on a trail I’ve never explored before. If you’re not a big outdoors person, call up an old friend and invite them to take a spin or yoga class with you. The friends who sweat together, stay together. This one sounds obvious—yes, I know we all watch movies with our friends from time to time. But why not make it a real movie date night? If you’re staying in, buy popcorn, milk duds—the works! If you’re going out to the theater, indulge in your favorite movie snacks and recap your favorite parts of the movie afterward. Bonus points if you see a comedy that makes you laugh so hard your abs are sore the next day. So many places offer group cooking classes now, which make the perfect best friend date. Sur La Table is one of my favorite places to practice my culinary skills with a friend. If you and your bestie are on a budget, you can browse through Pinterest or your favorite cookbook and choose a really crazy recipe that you’re both dying to try. And don’t worry if it turns out wrong…that’s where takeout comes in. Got a long weekend coming up? Take your bestie on an impromptu road trip! Simply pick a place that you can drive to in a weekend’s time, get in the car, and go. You can make it even more adventurous by not calling ahead and just staying in hotels you find along the way. Bring your camera for this one! I enjoy making trips to thrift stores to find inspiration for my Paper Crown and LC Lauren Conrad lines. But sometimes I’ll take a trip to a vintage store with a friend just for the purpose of trying on some of the crazy clothes. This bestie date is best when it’s not planned—just pop into a thrift store on your way home from Sunday brunch and see who can come up with the wildest outfit! Talk about a blast from the past… Get a bunch of your besties together on a night you have nothing going on and play the good ol’ game of truth or dare. You might find out some secrets from those friends you think you know the best—and you will all probably end up doing a dare you never thought you would! Note: Having an issue of Cosmo on hand is almost guaranteed to inspire some truth or dare ideas. As a self-declared dog lover and a mom of two pups, this is one date I have been trying to limit lately… I might end up with a third pet! But if you have enough restraint, take your bestie to your local pet store or shelter to ooh and ahh over the cute rescue animals. If you’re like me, you may or may not come home with a new fuzzy friend (guilty!). For those nights when you’re dying to go to a restaurant but there’s no love interest to go with, get dressed up with your bestie and go together! Personally, I love getting dressed up for girls nights. It’s different than putting together an outfit you would wear with a boy because there’s no one to impress but yourself. And while you’re there, go ahead and splurge. These bestie dates only happen once in a while, after all. 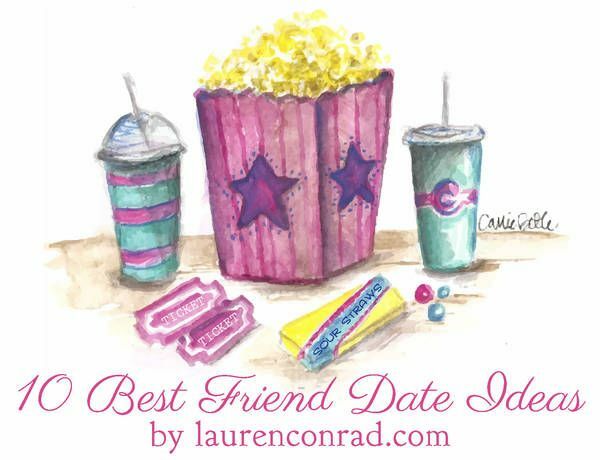 Which of these best friend dates will you go on first? Whichever one you choose, have fun!